At Covenant Presbyterian Church we believe in creating a space where people can have authentic encounters with Christ, discover their gifts and use them for God's glory, and spread the gospel to others. Join us for our Sunday morning service and Wednesday night gathering. We meet at 9:30 am on Sunday mornings for Sunday School, childcare is available and there are classes for all age groups. We meet together for our Morning Worship Service in the Sanctuary at 10:45 am. A typical morning service will last about 90 minutes. We sing a mix of contemporary and traditional music led by our praise team. You can look for our Greeters who are stationed at the front door to meet you and direct you to the right place! At Covenant, we're committed to walking beside you as you grow in your faith and relationship with Jesus. 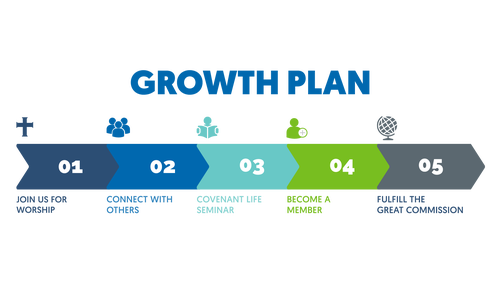 The growth plan is designed to help you as you consider membership at Covenant as part of your growth. We would love to hear more about you and share with you the beliefs and vision of Covenant Presbyterian Church during the next Covenant Life Seminar. We'd love to get to know you! Submit a Connect Card with your information, questions, or a prayer request.